I do seem to be in the habit of picking up books based on plot, regardless of whether it's in the middle of a series. Look, ain't no busy thirtysomething woman got time to read a whole series unless it's amazing. 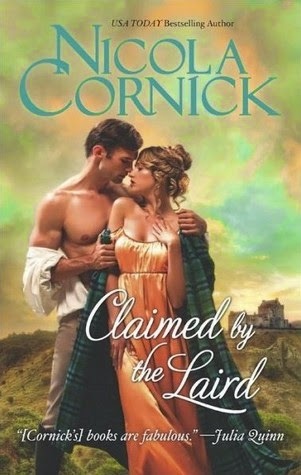 And the plot for this book really had to hook me to have me drop everything else and read it, especially considering it's Scottish and I'm not a fan of Scottish romance. But Nicola Cornick's name hooked me, given my earlier enjoyment of Desired. Thirty-three year old spinster? YES. Who's a secret whisky smuggler who disguises herself as "The Lady"? YES! And a younger hero who is out to bring down her gang? YES. But he's really there to find out who murdered his brother? YES. And he has to secretly go undercover as her footman/gardener to do so? OMG YES. Don't go by the cover of this book or the title. They're both stupid. The fact that the hero, Lucas, is a laird barely plays any role at all in this book. In fact, it all takes place at the heroine Christina's family estate. I loved this book. It was fun, had hilarious one-liners, great dialogue, sparkling banter and an intriguing mystery. It also had a wonderfully developed hero and heroine who were smart and interesting and funny and vulnerable and lovely. It's not often I consider a romance novel to be a page-turner but the plot was so masterfully executed and the characters so appealing I zipped through this satisfying novel in a few days. My only (minor) complaint is that there wasn't enough time spent on Christina's role of "The Lady." Bravo to this book and to Nicola Cornick for achieving my rare must-read author list.